The Volunteer Program Assessment (VPA, pronounced vee-pah) is a cutting-edge and innovative volunteer assessment system. Thanks to generous funding and support from our partners, VPA services are completely free for scholarship recipients. The assessment is designed to promote nonprofit organizational effectiveness by focusing on the volunteer program as seen through the perspective of volunteers using a comprehensive and validated volunteer attitudes and engagement survey. While the VPA is not a comprehensive assessment of your entire volunteer program, we are able to capture the voices of a key stakeholder group within your organization – your volunteers. VPA was developed by researchers at UNC Charlotte in 2009, and we are continually working to improve and expand our services. We are now supported by our fantastic partner, Maddie’s Fund. Our work would not be possible without them. 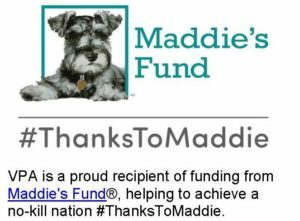 By promoting the effectiveness of volunteer programs, especially within animal welfare organizations, we are helping to work toward the Maddie’s Fund mission to achieve a no-kill nation. VPA is maintained by graduate students and faculty in the Organizational Science doctoral program at UNC Charlotte as well as our partner universities. While much of our consulting work is with animal shelters, we also work with all kinds of nonprofit organizations including police, health & human services, and arts & sciences. If you are interested in running the VPA at your volunteer organization please submit an application by clicking on the “Apply Now” tab. If you have questions before you apply, please email us at volprogram@uncc.edu. Please note that we respond to each incoming inquiry as quickly as possible, but there may be some wait time as our consultants are consistently working with clients.